I just love the two treble 4-sols in the middle of the piece that tie the phrases together. It’s difficult to know how to cite this tune. We referenced William Hauser’s Hesperian Harp (1848), p. 54, as the direct source, but gave Christian Lyre (1831) credit for the basic form of the tune—in this case, just the title and the Hesperian tenor is similar to the Christian Lyre. 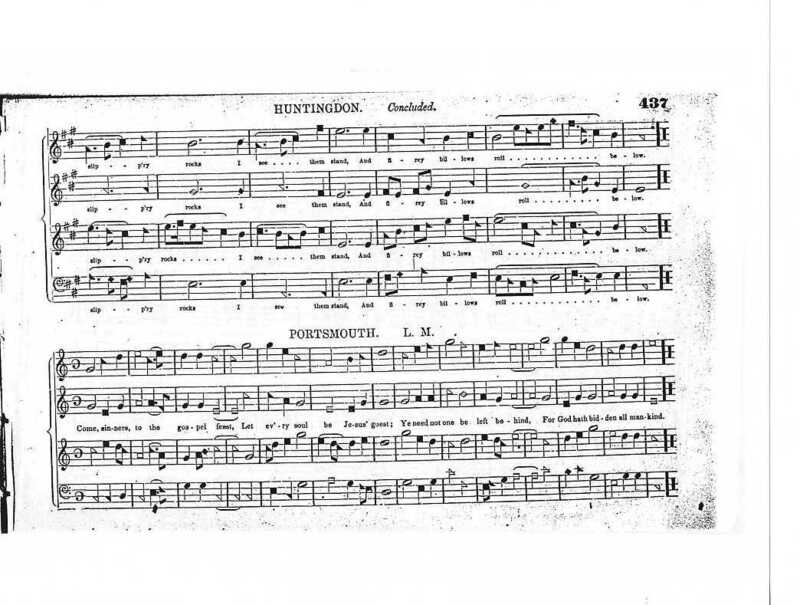 Nikos Pappas pointed out to me that the song is related, though not as similar, to CALVARY (with the same text and chorus) in Shaw & Spilman’s Columbian Harmony (1829), so the melody can’t solely be credited to Christian Lyre either. CHRISTIAN INQUIRY on p. 24 in Patterson’s Church Music (1813) is also related – and also ends the first phrase on that delicious 1-4 dyad. Oddly enough, I found the tune in an 1834 fraktur tunebook with a German text. So SUFFERING SAVIOR seems to be a genuine folk hymn that travelled from place to place through the oral tradition. Did Hauser arrange the tune for Hesperian Harp? I’m reluctant to credit it to him, as he wasn’t shy about taking credit for other arrangements. After all, there are a bunch of uncredited arrangements in that book that we now know come from Songs of Zion. On the other hand, it seems likely that he did rearrange it for his Olive Leaf, and yet takes no credit for it…. Perhaps just citing “Arr. in Hesperian Harp, 1848.” would make the most sense. Would SUFFERING SAVIOR have been sung with the raised sixth? Should it be sung that way today? I’m in favor of singing it that way because that’s what I like, and I do think that Hauser, who was interested in presenting melodies from the oral tradition, wrote in the sharps in the Olive Leaf because that’s how it was sung (he didn’t make this sort of “correction” in Hesperian Harp, but times had changed, or he had changed, or something). It’s interesting that a sharp is used as a sort of melodic leading tone elsewhere in the piece, even though it “spoils” the conventional V7/i cadence at the end. This may be, again, how it was sung – you can hear that sort of thing in Appalachian ballad singing, for example. In the Olive Leaf, Hauser also puts raised sixths in KEDRON (SH 48b), Monday’s WASHINGTON (CB 147, ShH 234), Lowry’s MECKLENBURG (ShH 259), O SAVE (SH 70b), RED HILL (version of BETHEL, SH 27), MESSIAH (SH 131t), NEW BRISTOL (version of CHILD OF GRACE, SH 77t), TIME FLIES, MOURNER’S PRAYER (version of Christian Harmony 144 WALK WITH GOD, ShH 3t), FAIRFIELD (SH 29t), SWEET PROSPECT (SH 65), DETROIT (SH 39t), EMORY (version of CROSS OF CHRIST, SH 123b), WEEPING SAVIOR (SH 33t), Billings’ NEWINGHAM, Wetmore’s AMERICA (SH 36t), Smith’s PSALM 119 (ShH 428), WONDROUS LOVE (SH 159), and HEDDING (version of HEAVENLY SPARK, ShH 83t). And he goes full Dorian in HAPPY SOULS (MIDI), the only shape-note song I’ve encountered in the “key of re.” He does NOT write the raised sixth in BEGONE UNBELIEF (THO’ DARK BE MY WAY, ShH 305) or BABYLON IS FALLEN (SH 117), though he does alter other notes in BABYLON. To sum up, Hauser puts raised sixths in pretty much every minor song that has sixths in it. BEGONE UNBELIEF is an exception because it modulates from major to minor like the version of CONFLICT I discussed in an earlier post. I don’t know why he didn’t do it in BABYLON—perhaps because he knew that its author, the scholar William E. Chute, who helped him with the Olive Leaf, didn’t want them? It’s really interesting that he writes raised sixths into New England songs as well. Here’s what I imagine SUFFERING SAVIOR would look like with “Olive-Leaf-style” accidentals. Only now the arrangement has problems with some weird conflicts between the alto and tenor–perhaps one reason Hauser ended up altering all the parts. Although Hauser’s notation of the raised sixths corresponds to how we are taught in the Sacred Harp rudiments (both of them), be aware that he alters a lot of other pitches, too—sevenths, and then there’s this “leading tone” phenomenon. He also alters notes in major songs. I’ll see if I can write down the rules he uses, because there seem to be some, and my hunch is that they’re melodically rather than harmonically driven. Hauser writes in the Musical Million that other singers said that it was impossible to sing minor music with instruments, but he disagreed—he said that the instruments ought to conform to what the singers did, and I assume the altered notes in the Olive Leaf are done for this purpose. Instrumentalists played the song as written and singers altered pitches by tradition, so they couldn’t sing with instruments. Hauser played several instruments and would have been sensitive to this problem. I’m planning on making another post about raised sixths, raised sevenths, and other chromatic and microtonal alterations, so I’ll leave this topic for a more thorough discussion later. 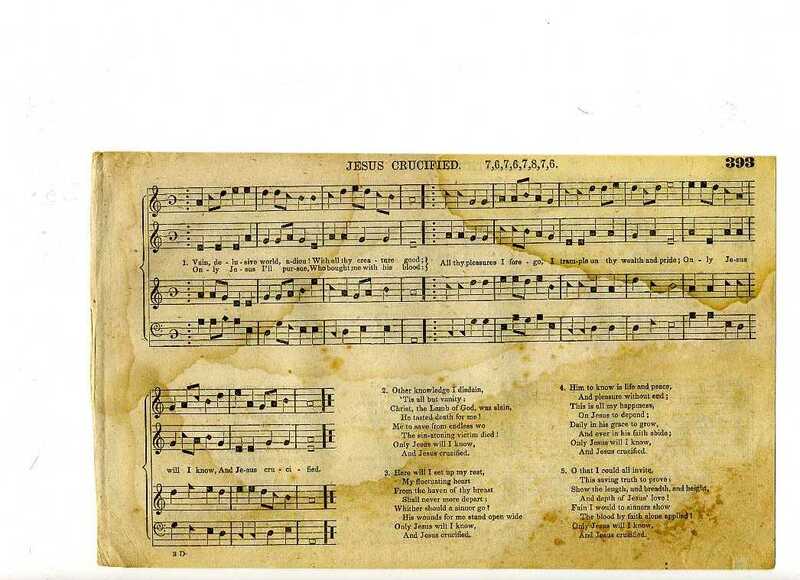 Matt raised another question—the written-in attributions in William E. Chute’s copy of The Olive Leaf of SUFFERING JESUS and HEDDING to the New England composer Daniel Read. This seems to be Chute’s mistake, and it was propagated in other books, like Durand & Lester’s Primitive Baptist Hymn and Tune Book. Both SUFFERING SAVIOR (CALVARY) and HEAVENLY SPARK (like HEDDING) are in Shaw & Spilman’s Columbian Harmonist. Read also published a Columbian Harmonist. Presumably Chute had some sort of indexing system and it failed him in this case. 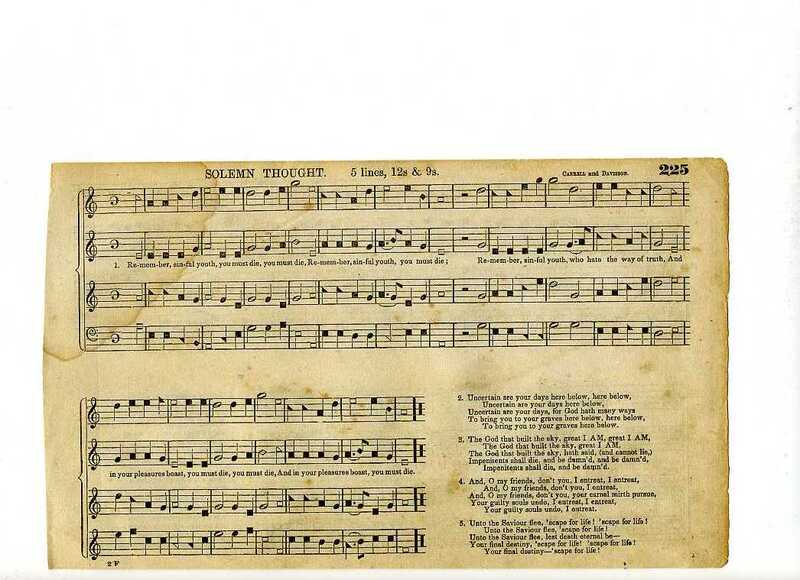 One of the joys—and sometimes frustrations—of choosing songs for The Shenandoah Harmony was the often overwhelming number of different shape-note arrangements available for the same song. BOURBON (13t), which has been in print since 1814, is a classic example. We chose two different settings of the melody (13t BOURBON and 260t CONFLICT) plus two closely related melodies (7t SUPPLICATION and 305 THO’ DARK BE MY WAY). I’ve been fascinated by the difference in harmony between BOURBON and CONFLICT for a long time. The song goes under several other titles, including MEDITATION, DISMISSION, and BRETHREN, PRAY. I started collecting different versions. With the help of Nikos Pappas, I have found twelve harmonizations from the years 1814-1911 that are substantially different from each other, plus a handful that differ from these in a minor way. This post is a sketch for a much longer academic article I’m writing about the BOURBON tune family. The story is a fascinating one, covering not only the history of this particular tune, but also the process of tunebook compilation and editing, the shift away from “ancient-style” harmony and towards “scientific” functional harmony that occurred over the course of the nineteenth century, the change in attitudes towards the minor mode and modal music in general, and the transformation of the physical form and function of American hymn and tune books in this period. BOURBON, The Beauties of Harmony, 1814. DISMISSION, The Missouri Harmony, 1820. MEDITATION, The Southern Harmony, 1835. BRETHREN, PRAY, The American Vocalist, 1848. 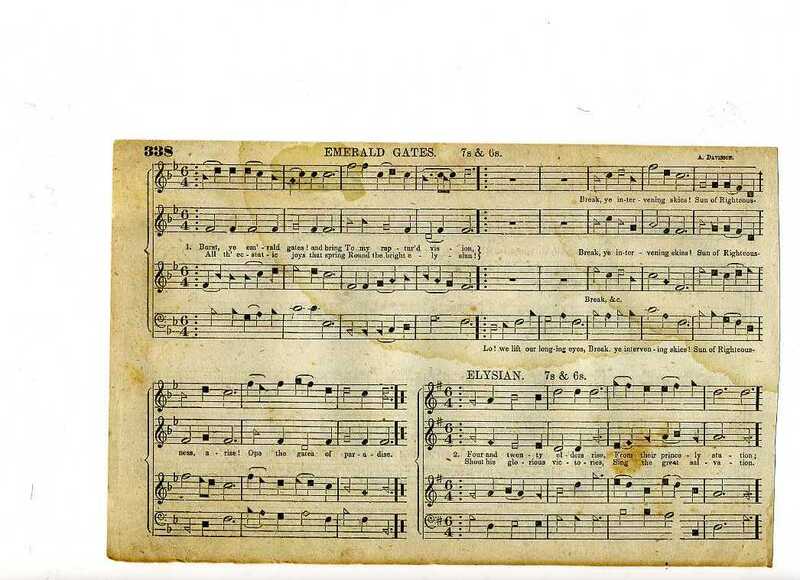 CONFLICT, Hymn and Tune Book, for use in Old School or Primitive Baptist Churches, 1886. Please note that you can click on any score to see a larger version. Also there are MIDI files available for all the music on this page—just look for the link that says MIDI and click on it. 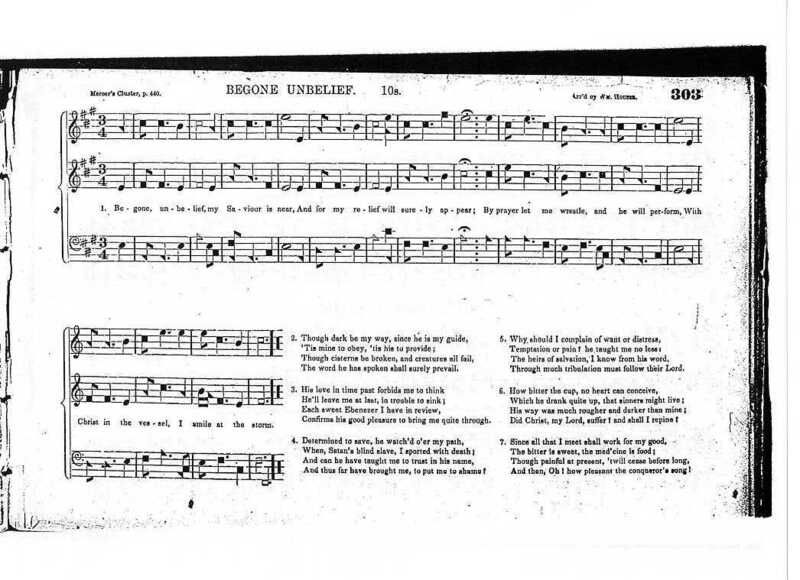 Below is the first published version of the song, from Freeman Lewis’ Beauties of Harmony (1814). Notice the alto clef and the archaic time signature (the backwards “C” meant 4/4 measure at a moderate tempo, led in two beats per measure). I wonder how the clash between the sharp 7 (sol) in the tenor and the natural 7 in the other parts was supposed to resolve. Modern Sacred Harp singers would probably ignore the sharp, but we don’t know what Lewis expected from his students. Tunebook compilers often changed or “corrected” songs they selected from other books. 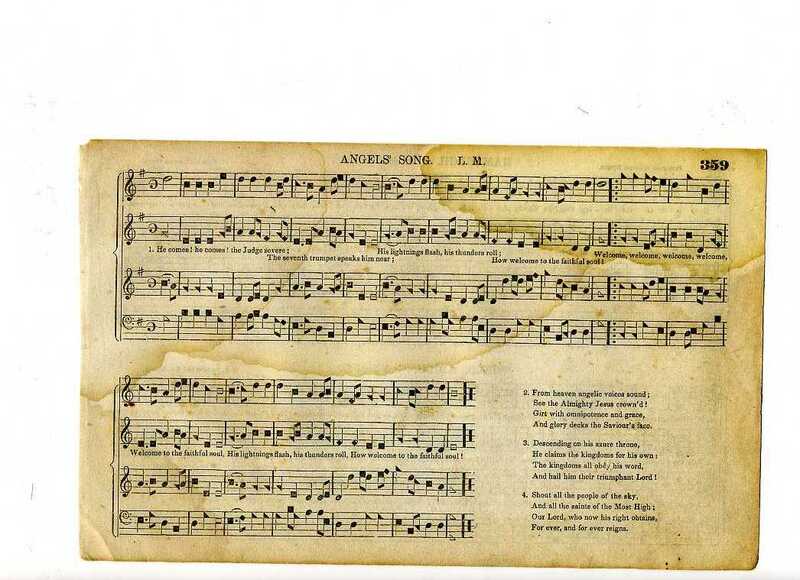 In the first edition of A Supplement to the Kentucky Harmony (1820), Ananias Davisson prints the Beauties of Harmony arrangement, with the accidentals omitted (Davisson didn’t believe in accidentals) and with the alto in the treble clef. This type of change to rhythms or individual notes was quite common. Lewis’ (or Davisson’s) arrangement appears in several subsequent books; sometimes the alto is omitted. Both this song, DISMISSION, and Davisson’s version of BOURBON appear in the first edition of The Missouri Harmony (1820). Identical or similar versions of DISMISSION are in several other books. William Caldwell added an alto in his Union Harmony (1837). The arrangement of MEDITATION that Walker selects for The Southern Harmony seems loosely based on DISMISSION—look at the treble in particular. If we define dissonances to be seconds, in any octave (so that sevenths and ninths also count as dissonances), this one definitely wins the award for the most of them. I’ve highlighted all the dissonances in red. In 1866, Walker added an alto, revised the treble and bass, and adopted the more modern seven-shape notation. As Karen Willard pointed out, in a thought-provoking thread on fasola-discussions that she titled “evolution in harmonic tastes,” William Walker commented, “The harmony of this tune has been corrected and improved expressly for this work.” You can see that there are now only three dissonances, despite the added fourth part. The phrase bars indicate the end of each line of poetry. The Deason-Parris revision of The Christian Harmony (1958) has still more changes. The number of dissonances is the same, but they appear in different places. In addition, the alto moves up to “si” right before the repeat sign, completing a minor triad rather than doubling the treble and leaving an ambiguous dyad. This version is also in The Christian Harmony, 2010. While ancient-style part writing places the melody in the tenor and gives each voice part a melodic line to sing, scientific or reformed harmony often locates the melody in the soprano and employs chord progressions, rather than individual melodic motion in the supporting voices, to give the piece forward momentum. Although Mansfield’s round-note American Vocalist was published before The Christian Harmony, it contained a mix of ancient and reformed styles. The melody is still in the tenor, but in other ways this setting is much more “scientific” than any we have seen yet, using standard chord progressions like iv-V-i. Mansfield also “corrects” the rhythm by setting the song in 3/4. 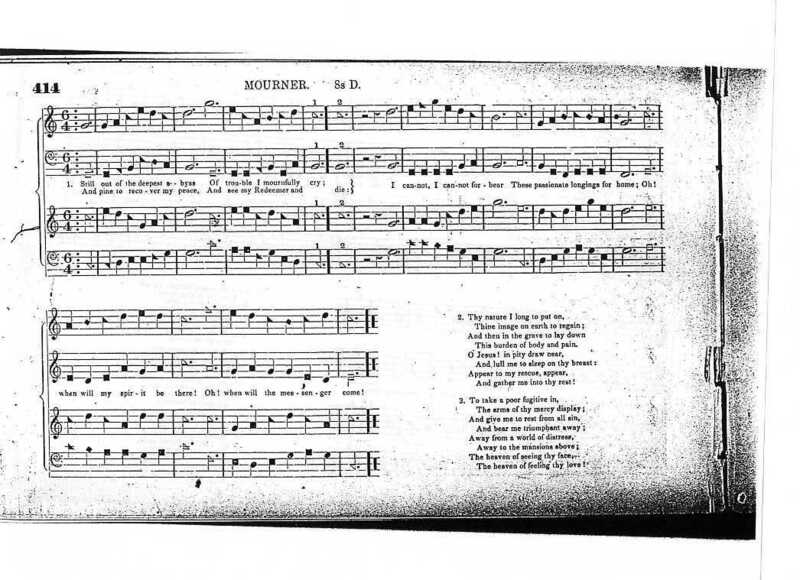 Quite possibly the strangest old arrangement of any shape-note song appears in the Primitive Baptist Hymn and Tune Book by Durand & Lester, 1886. 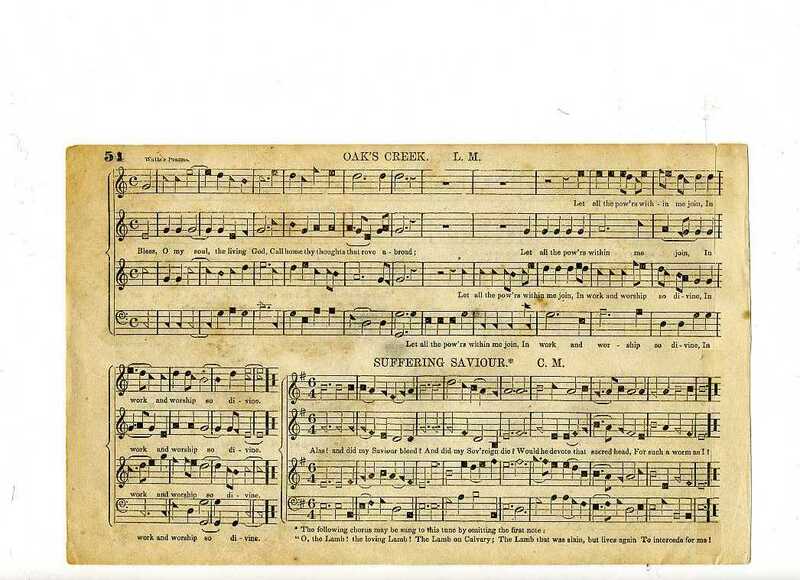 By the 1880s, minor songs were completely out of fashion, partly due to the notion that they couldn’t be harmonized “scientifically.” So… The song is recast in a major key, with the melody ending on the sixth degree of the scale. Wow. 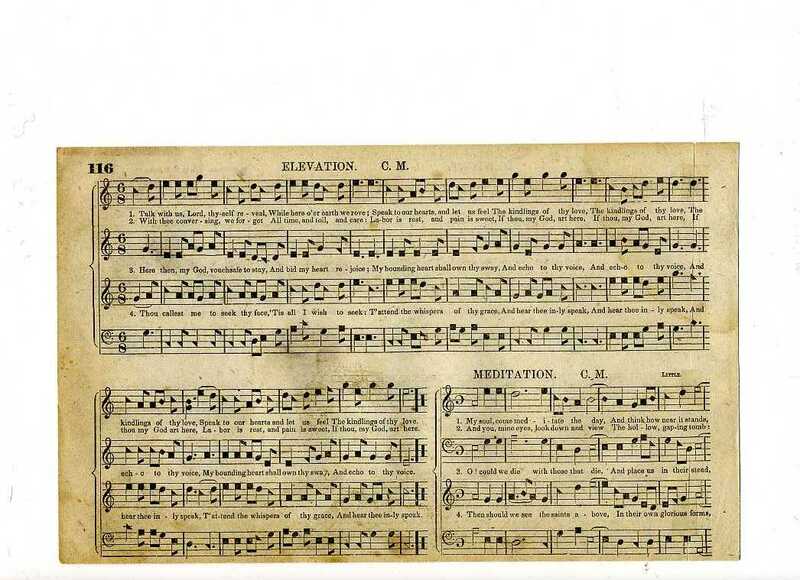 Note the upright format of the pages—oblong books were expensive to produce, and these condensed scores, with the melody on top, were easier to read on the piano or organ. 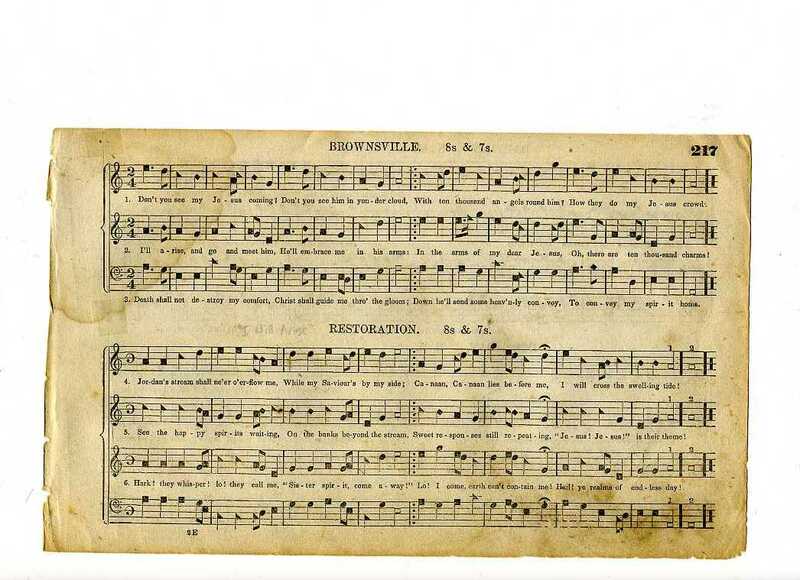 Daily’s Primitive Baptist Hymn and Tune Book preserves some of the strengths of the Durand & Lester setting without the awkward ending. After firmly establishing the major key (Bb) by the end of the first line, it modulates to G minor in the last few bars. There’s even a German sixth chord in the last complete measure! 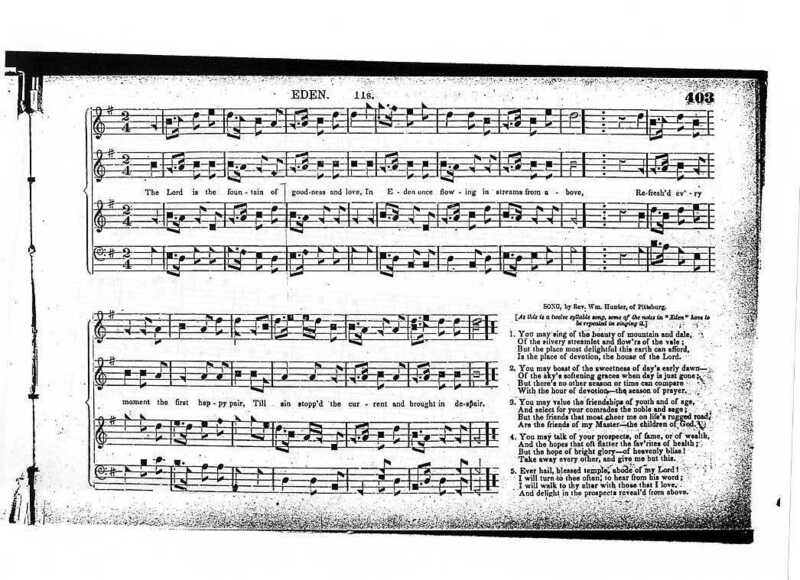 Very similar settings appear in the Old School Hymnal and The Shenandoah Harmony. Daily wasn’t the first shape-note arranger to make this sort of modulation—check out Hauser’s BEGONE UNBELIEF (MIDI), which is the basis for my arrangement of THO DARK BE MY WAY. It’s amazing that Hauser, in 1848, anticipated this early 20th century setting. 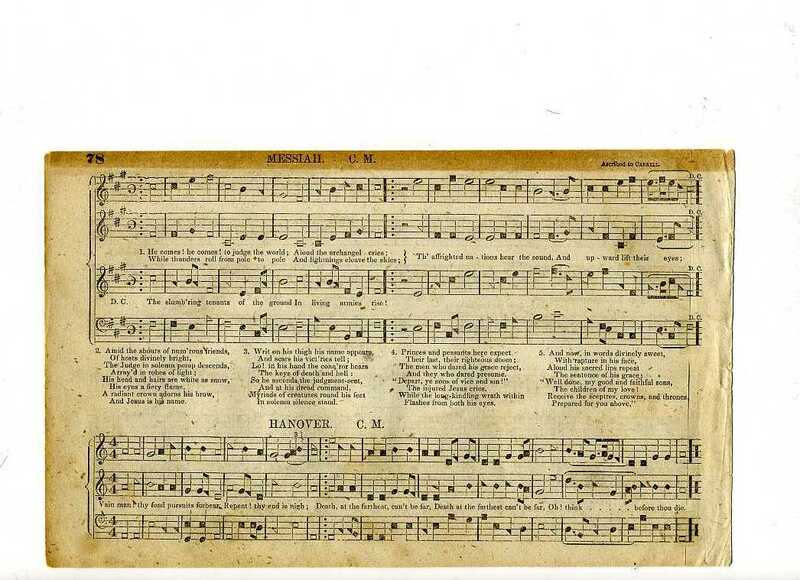 There are several new arrangements of the BOURBON tune family in modern hymnals. I particularly like Louise McAllister’s 1958 setting in The Worshiping Church (1990), which retains the modal character of the original. Here’s a MIDI. Some readers were so fascinated by Durand & Lester’s setting that I posted a bunch of scans here: Selections_from_Durand_and_Lester. I also transcribed O LAND OF REST (PDF) and you can hear the MIDI, too! This one, I want to sing. It’s attributed to Caldwell, but that’s just the melody – his setting, called New-Market, was harmonized in the minor mode, with the ending note as the tonic (E minor). Chorus “Viva la face, viva l’amor!” from Atalanta, 1736. This is probably the most interesting arrangement to sing because it’s so different from the style of the subsequent “folk” versions. I’ve transposed it down from the original key of D major and set it in shape notes, but kept the melody in the top part—a true soprano. 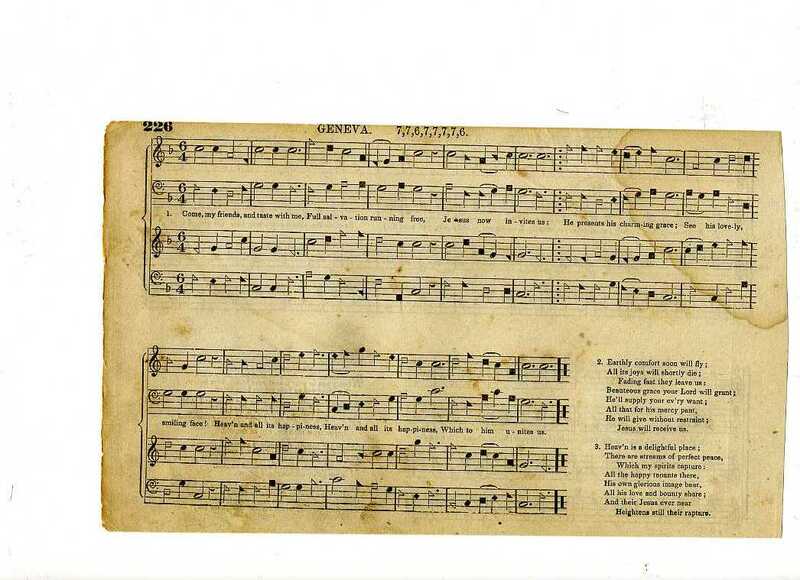 American Musical Miscellany, 1789. 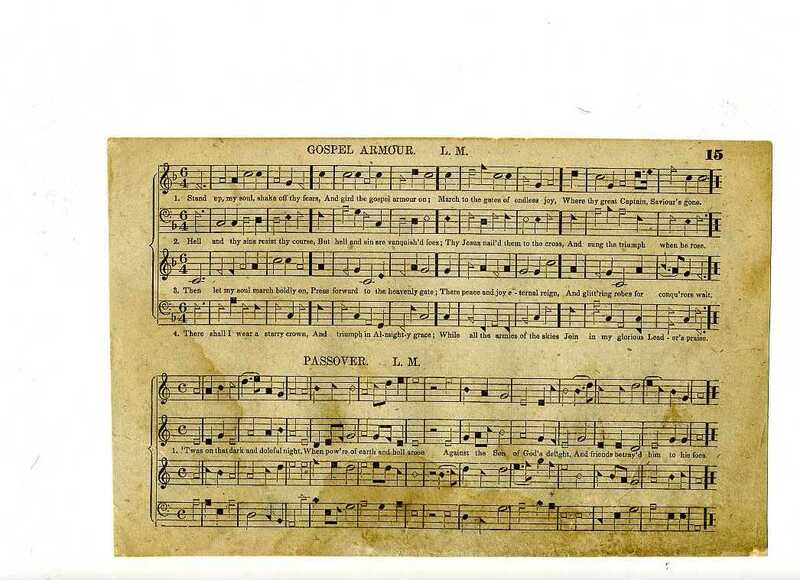 The version of FRIENDSHIP in this small book of mostly secular songs and melodies inspired the arrangement on 221b of the Shenandoah. I changed the bass slightly and wrote an alto and treble part. A Supplement to the Kentucky Harmony, 1820. This four-part arrangement is attributed to Cook. Yes, the alto ends the song on the sixth degree (la) of the scale! I’m guessing this was a printer’s mistake, especially since the corresponding phrase ends with the fifth degree (sol) earlier in the song. The Southern and Western Pocket Harmonist, 1846 (based on the arrangement in Wyeth’s Repository, Part II, 1813). The bass in this setting is almost identical to Wyeth’s; the treble is a simplification of the Wyeth’s treble, which had some difficult leaps. This arrangement is also in the Christian Harmony, with an added alto. 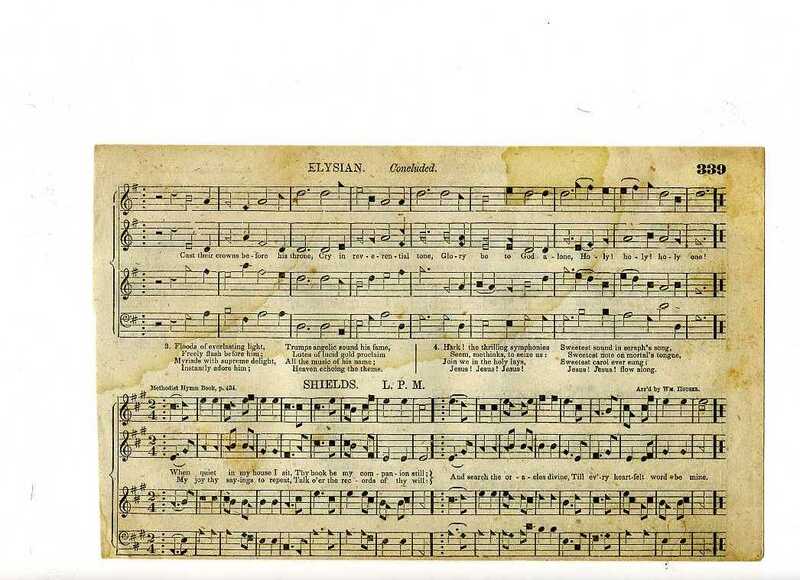 Here are four favorite melodies I find myself coming back to time and again… All four were published by Ananias Davisson in the Shenandoah Valley. They’re all minor and seem, at least to me, similar to a lot of Irish tunes I heard growing up. They’re also some of the more difficult songs in the book. Dan and I made some rough recordings of just the tenors so you can hear them without the other parts. We’ve chosen to sharp the sixth degree of the scale in all of these. Mecklinburg is probably named for Mecklenburg County, Virginia, which is in the far south of the state. 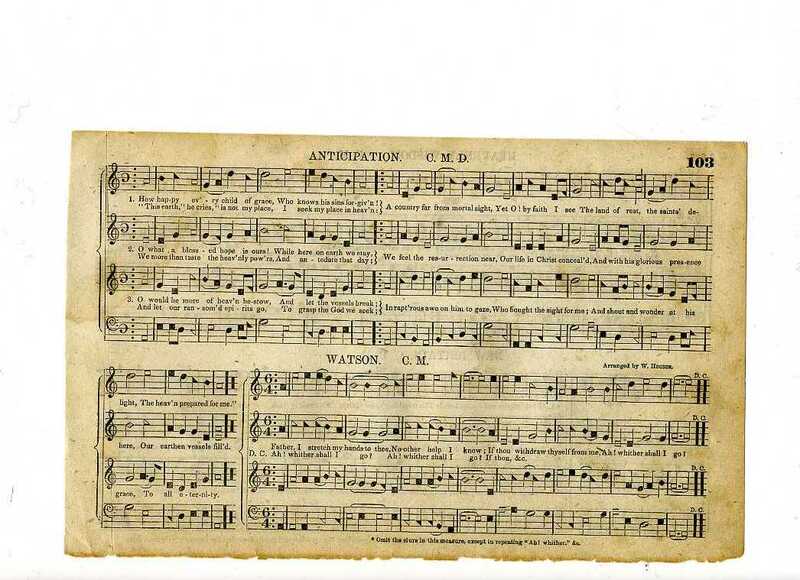 Sarah Anderson Jones (1753-1794), the mystic Methodist poet who wrote the lyrics, lived all her life in the county and that may explain the title of the tune. She was quite a character–I recommend reading Hartweg’s article All in Raptures HERE to find out more about her. The tune is somewhat related to the Irish comic song “St. Patrick was a gentleman.” It was first published by Davisson in A Supplement to the Kentucky Harmony (1820). 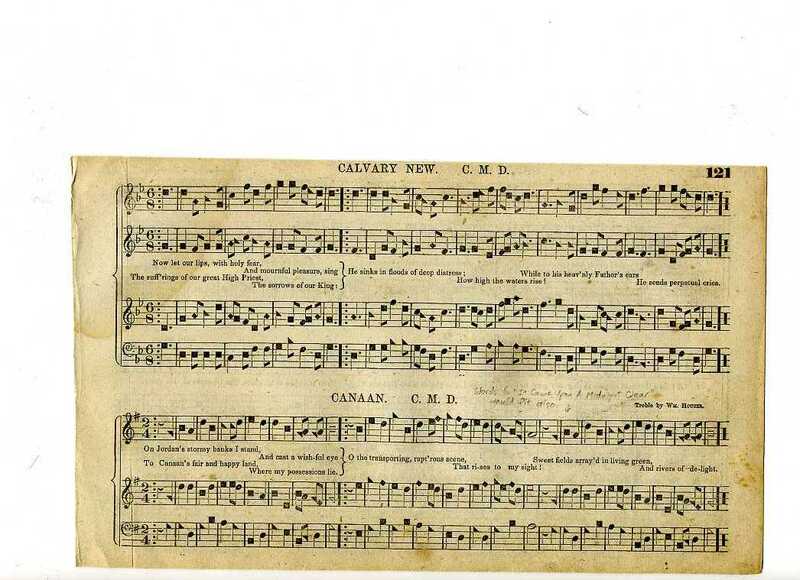 Our favorite version of Carmel comes from the seven-shape Sacred Melodeon; there’s more about the text at Hymnary.org. 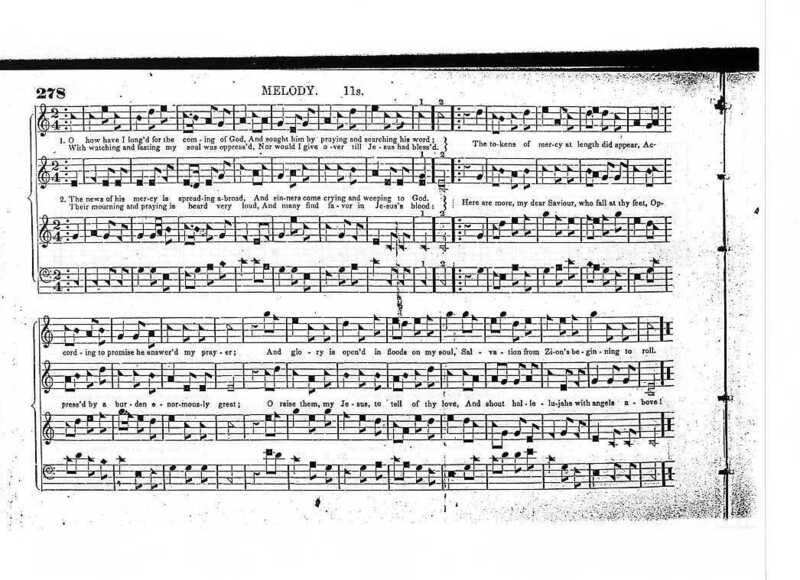 The melody was first published by Davisson in A Supplement to the Kentucky Harmony, ed.3 (1826) under the title Elysian Plain. THE iconic Davisson song. 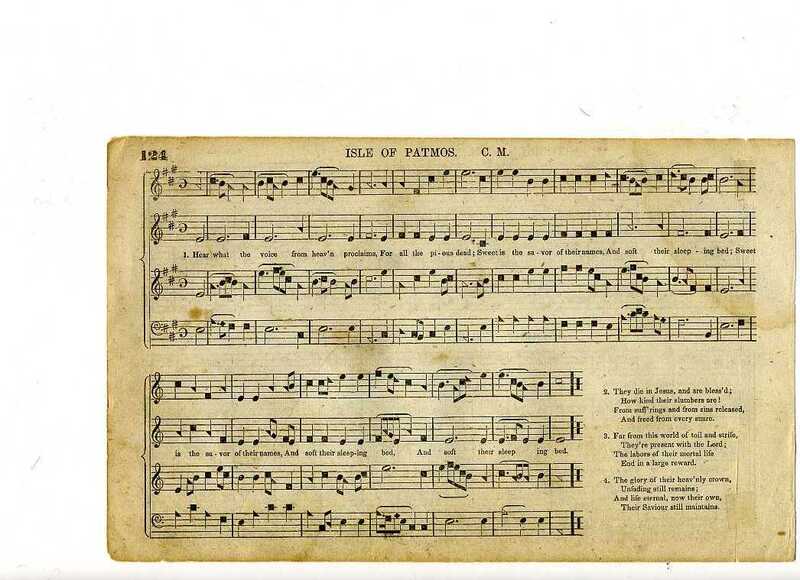 It was first published in Davisson’s Kentucky Harmony, ed.2 (1817) and was popular in many later shapenote books, including The Southern Harmony and The Sacred Harp. 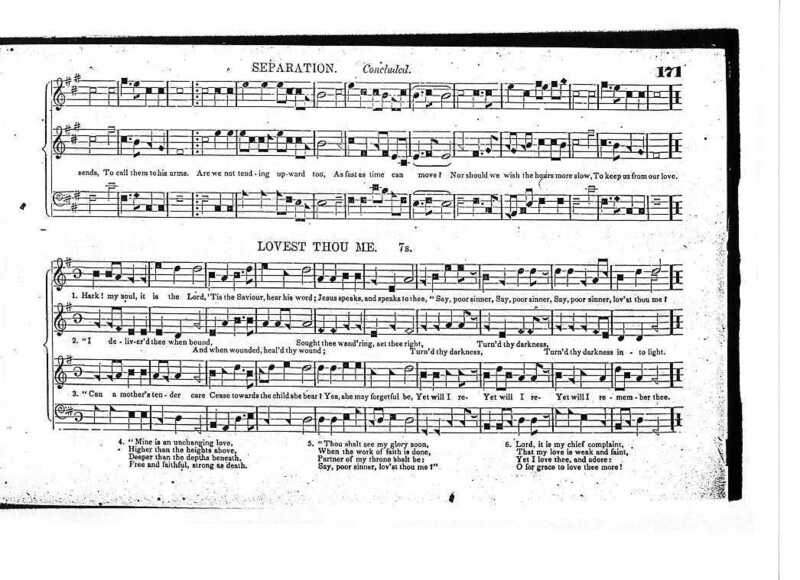 Nobody seems to know much about this song, but I think it’s one of the most beautiful in the book… The melody was first published by Davisson in A Supplement to the Kentucky Harmony, ed.3 (1826). We had a wonderful time singing in Massachusetts on Sunday, April 14th. Thanks to everyone involved! There was a great variety of songs called. Though some of these recordings are rough, they’re useful as an aid to learning the songs, so we’ll just post them all…. There are some real gems, too – check out the closer.